Illustration by Brian Stauffer, New Yorker. From reviving the East India Company to questioning whether the American Revolution was a good idea, here are this week’s top picks in imperial and global history. When he left his native India to set up a business in London in the 1980s, Sanjiv Mehta never dreamed of returning home one day with the East India Company in his pocket. By 2005 he had bought the entire company, which gave him the rights to trade using its name, and its coat of arms as a trademark. Political parties on the far right are today enjoying a surge of support and access to government power that they have not experienced since their heyday in the 1930s. This phenomenon is particularly striking in Europe, where massive migration, sluggish economic growth, and terrorism have stirred up zealous nationalism and Islamophobia, but it resonates through large areas of the world including the Asia-Pacific. Today, the expression “concentration camp” evokes the horrors of Nazi Germany, conjuring up black-and-white images of Auschwitz and Belsen. But Germans were neither the first nation to make use of concentration camps nor the last. Alliances between maritime Empires in the late eighteenth and early nineteenth centuries were rarely harmonious; but only a few hold the distinction, of being completely dysfunctional. The post-Napoleonic War alliance between Britain and Spain for the purpose of abolishing the slave trade was one of the few. The anti-slave trade treaty of 1817, which had pledged Spain to Britain’s anti-slave trade cause and was the cornerstone of the alliance, established a court of mixed commission at Havana for the purpose of condemning illegal slave ships [see Blog Post 1 for an explanation of the treaty and the courts]. The treaty, however, did not come into effect all at once. Spanish slave trading on the coast of Africa north of the equator became illegal in 1817. And what if it was a mistake from the start? The Declaration of Independence, the American Revolution, the creation of the United States of America—what if all this was a terrible idea, and what if the injustices and madness of American life since then have occurred not in spite of the virtues of the Founding Fathers but because of them? 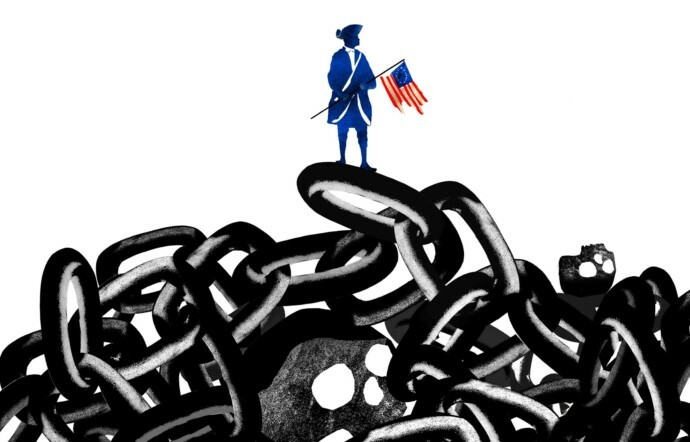 The Revolution, this argument might run, was a needless and brutal bit of slaveholders’ panic mixed with Enlightenment argle-bargle, producing a country that was always marked for violence and disruption and demagogy.